For the Cheddar Chive Biscuits: Preheat oven to 425º F.
In a large bowl, whisk together the flour, baking powder, sugar, baking soda, and salt. Using a pastry cutter or two knives, cut the chilled cubes of butter into the dry mixture, until the texture resembles small pebbles. Pour the buttermilk over mixture, add chives and cheese, stirring gently to combine. Pour the dough out onto a lightly floured surface and knead until dough comes together. Roll out the dough to a 1/3-inch thickness. Using a 1 1/2-inch ring mold, cut out biscuits. Repeat process, being careful not to over-knead the dough. Place on a parchment lined baking sheet and bake for 8-10 minutes, until golden brown. 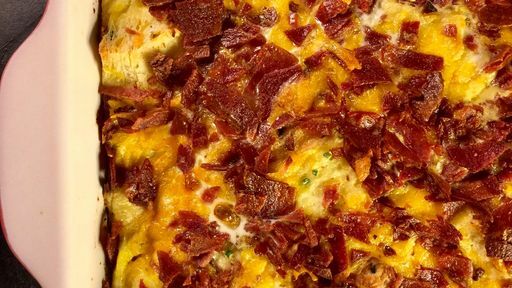 For the Bacon, Egg and Cheese Casserole: Preheat oven to 350º F. Butter a 9 x 13-inch casserole dish. In a small bowl combine three whole eggs and three egg whites. Reserve remaining 3 egg yolks for another purpose. In a large bowl, whisk together eggs, milk, chives, and season to taste with salt and pepper. Halve all the biscuits crosswise, then quarter each half. Place the cut biscuits into the bottom of the prepared casserole dish. Sprinkle biscuits with the turkey bacon and cheddar cheese. Pour egg mixture over biscuits. Cover and refrigerate for 30 minutes, allowing the egg custard to be absorbed into the biscuits. Cover with foil and place in oven to bake for 30-35 minutes, or until set.